The white spinning top candlestick pattern has a single candle. The body of the candlestick is white and very small. The upper and lower shadows are longer than the body. In this pattern, the opening and closing stock prices are near each other. This pattern forms when there’s indecision among the buyers and sellers. The market is indecisive regarding its trend. In case of a spinning top, the color of the body is not so important, so the interpretation of both black and white spinning top is identical. What does a white spinning top pattern show? If this pattern occurs after an upheaval or a long white candlestick, it reflects weakness among the bulls. It is a warning of a potential change or an interruption in the prevailing trend. If it is detected following a downtrend or a long black candlestick, it shows weakness among the bears and can be a sign of an upcoming change or a reversal in the trend. 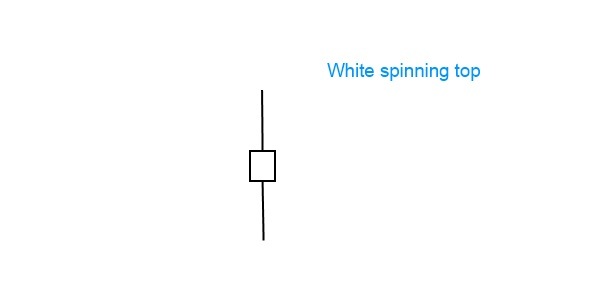 Like most other single candlestick patterns, the white spinning top has low reliability.